Standard Office – These are the usual chairs seen everywhere from office buildings to homes and the most readily available. 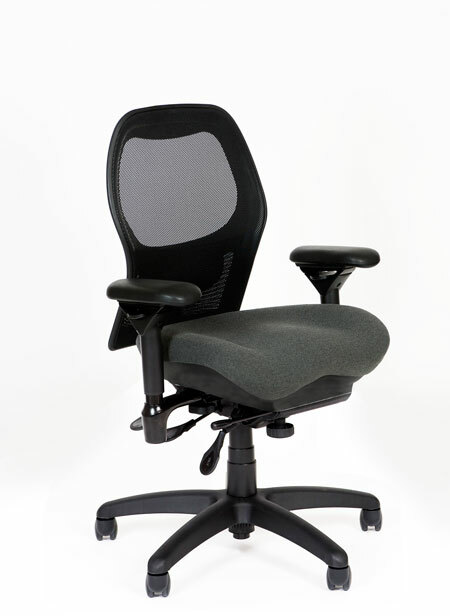 Ergonomic office chairs include basic features such as lumbar support, adjustable backrests, adjustable armrests, different types of foam padding, and more. This normal version is the simplest option; however, there are more inventive designs available that offer even greater user comfort and support. Reclining – Generally larger than a plain office version, the ergonomic recliner is designed for the most comfort and back support when in a partially or totally reclined position. This is especially useful when suffering from certain advanced spinal conditions, as it reduces the amount of vertical pressure on the spine and discs. Reclining ergonomic chairs can be ordered with add-on table attachments or free-standing tables that slide over the seating area, making it possible for the computer to be reached as well as anything else close by that is needed to get work done. Kneeling – With this design, a user is positioned in a partial kneeling position with the knees bent and all weight positioned between the hips and the knees. They do not have backs and with the forward-slanted seat that tilts the pelvis forward at an angle, the back remains a correct straight position and spinal compression is reduced. The body is self-supporting in this partial kneeling position, which makes sitting less painful. Through proper spinal and hip positioning, stress and fatigue on the the body is reduced. Saddle – This chair positions a user as if riding a horse wearing a saddle, somewhere between sitting and standing, and come with or without backs. The shape, height and angle of the seat positions a user with the pelvis tilted forward enough to maintain proper spinal positioning. A wider support base is created by somewhat separating the legs. Although odd looking, saddle chairs can be a great office seating choice for users with lower back pain office chair components built around it to promote correct sitting, good back posture, and greater movement while seated. This very unusual chair is said to help keep back and leg muscles fit while allowing for readily-adjustable comfortable. Once having decided on a chair style, make sure the best results are achieved by insisting on the best quality possible. All of these chairs should be made of durable material, provide the best spinal support possible, and be completely adjustable so each chair can be individually tailored. There are indeed many different ergonomic office chairs available, so choose the one that best fits each worker’s needs! Find Many Types of Ergonomic Chairs at the Ergonomic Chairs Store! Considering replacing existing office seating with ergonomic chairs? Call the Ergonomic Chairs Store at 979-217-3044 to find out how improved health and happiness can be found with ergonomic office chairs! By Ergonomic Chairs||Uncategorized|Comments Off on Discover The Many Ergonomic Chair Styles!